So for my project, I chose to make a swatchbook for a fictional paper company called Solar Paper Co. My project would showcase a variety of different options available at Solar in several different small collections. So I decided to theme my swatch book on our planetary solar system. The solar system is comprised of 9 planets that orbit the sun. Each planet has different qualities and characteristics based on its composition and location. Similarly the Solar swatchbook organizes all the different kinds of paper in the Solar Paper universe into 9 basic collections based on paper composition, colors and qualities that correlate with the planet that the collection is named after. For example, Venus is known for being the brightest planet because of its highly reflective surface composition and the Venus Paper collection showcases Solar’s most reflective papers with shiny irridescant surfaces. Each collection showcases unique qualities of Solar’s paper collection that correlate with a planet in our solar system. For this project, I was asked to conceptualize and develop a design for a special edition paper swatchbook with strong visual reference, which showcased various samples of paper types, specifications, availability, certifications, and other informational material. The Swatchbook required various technical and informational elements in both the creation of the digital files and the final output piece. My client for this project, Solar Paper Company, is a fictional Paper Supply and Manufacturing Company in Atlanta, Georgia. For this project, I worked on the development and creation of a swatchbook that would not only capture the unique qualities of the paper that Solar has to offer but also display the diverse array of options available for order. With the name Solar, I immediately starting thinking of the sun, space and our solar system. And that was when I made the connection of linking the complex vast system of fine papers available at Solar to the vast solar system we reside in. I then began research on the solar system and its characteristics looking for ways I could relate it to the paper collections. I finally landed on the concept of creating a paper collection based on a physical characteristic of each planet. Further research on the planets proceeded leaving me with nine final collections. 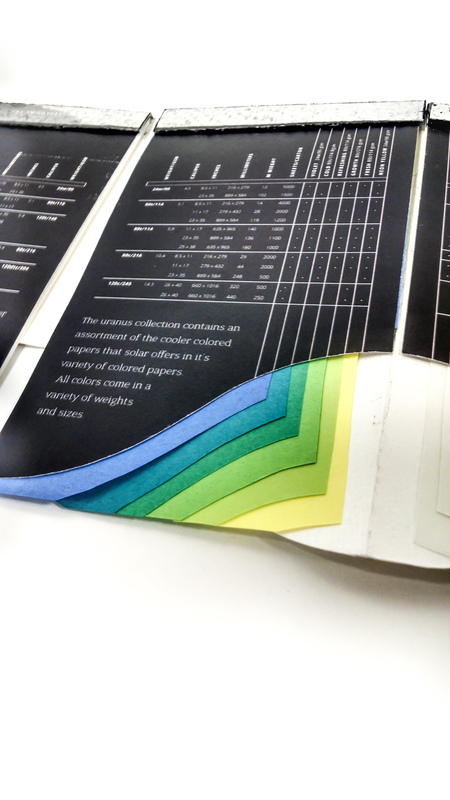 The Solar Swatchbook highlights the best of the paper products available at Solar Paper Co. Organizing its finest papers into collections with qualities that correlate with each of the planets in out Solar System, the Solar Swatchbook is an essential tool to discovering how Solar can best meet your needs as a designer and the needs of your next project. This book is more than just a collection of paper, it is also an educational experience. 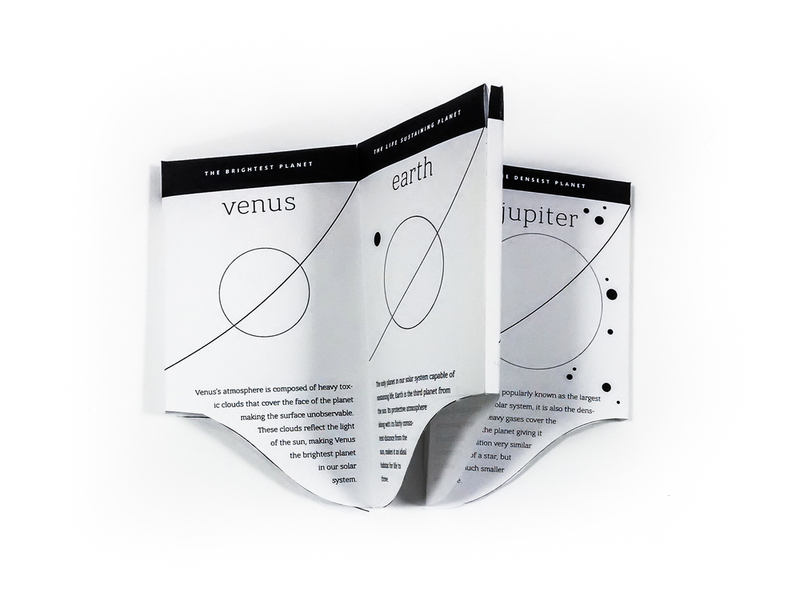 Each page of the book features a specific planet in the Solar system and tells a few facts about the planet's composition and surface qualities. After the book has been flipped through page by page, planet by planet, it also completely unfolds to reveal the entire solar system in order continuously as one massive spread in which every planet's collection can be viewed all at once. Turning the last page of the book reveals exclusive information about each paper collection on the reverse side of the planetary information (in this case Pluto). The form of binding allows the viewer to then read backwards through the book from the reverse side as well, showing all new information about the specific papers in each collection. A short paragraph at the bottom tells about the papers themselves, while the the chart above provides important information about what sizes and weights are in stock as well all the technical information about each kind of paper.